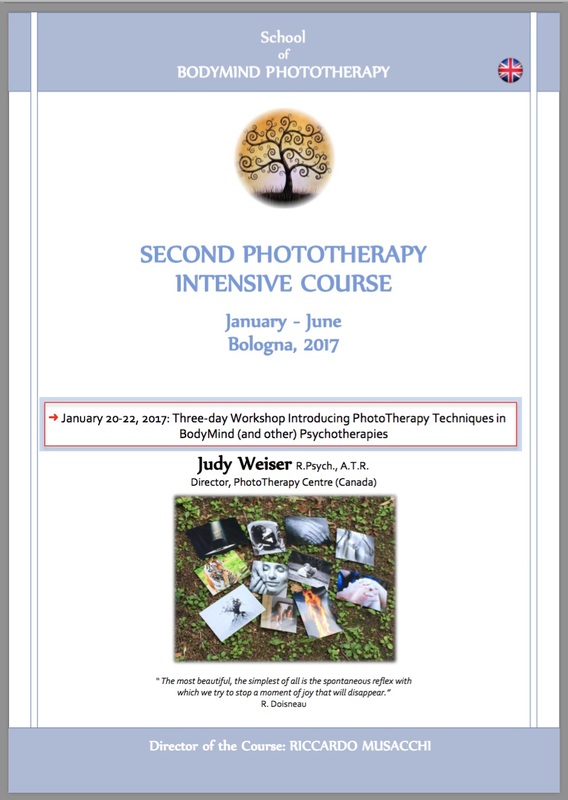 “Judy Weiser is the leading world expert on the application of PhotoTherapy Techniques in the mental health field — and I highly recommend attending her Workshops and Trainings to support and expand your practice. I have taken several trainings with Judy, and each time I have learned new skills for improving my practice as a Licensed Clinical Professional Counselor. Below are Judy Weiser’s upcoming presentations, experiential workshops, and intensive training events — as well as past ones in recent years. —> For more information about Training and Education opportunities and possibilities to arrange a Contract to bring her to teach in your area, please click here. 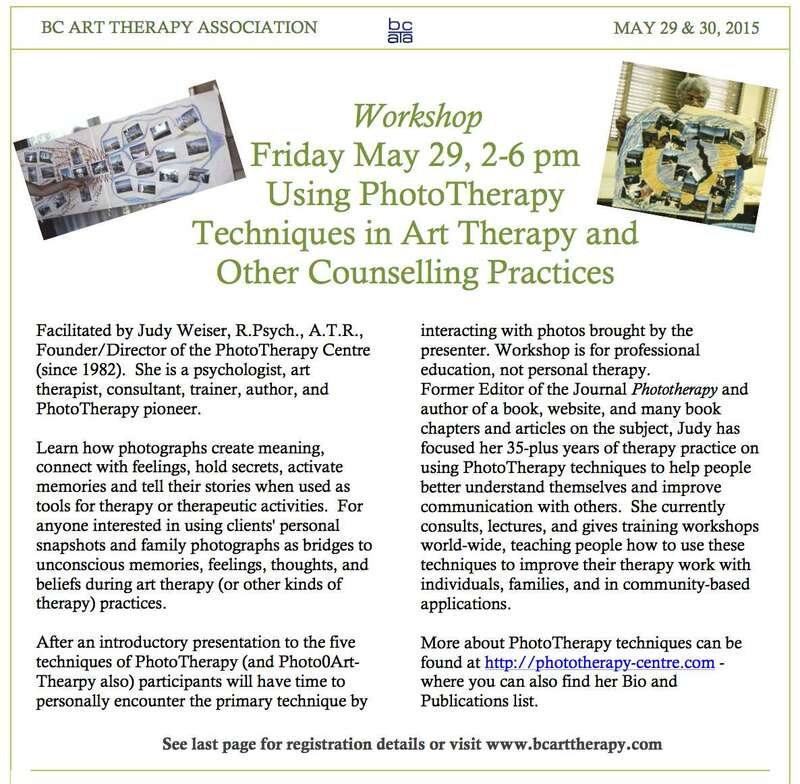 For Students of the Masters of Counselling Psychology – Art Therapy Program of Adler University (Vancouver Campus) — others may attend as ‘Guest Observers’, but must be pre-approved by Instructor (Judy Weiser). NOTE: More events will be added here as soon as confirmed — please keep checking back for updates! 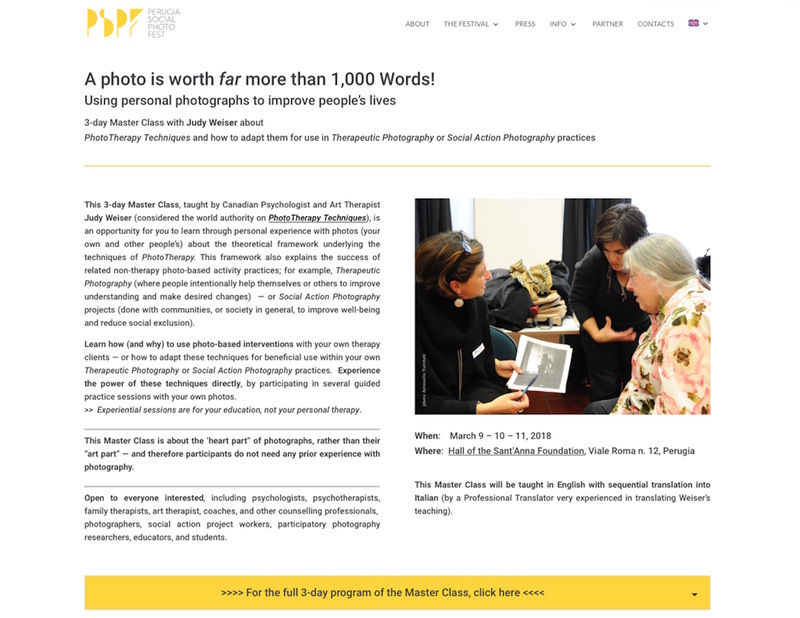 3-day Master Class (open to everyone interested): “A picture is worth far more than a thousand words — Using personal photographs to improve people’s lives: Adapting PhotoTherapy Techniques for use in Therapeutic Photography & Social Action Photography practices” — all day Friday March 9 through Sunday March 11, 2018. Workshop is open to anyone interested (not just the Scuola students), and will be sequentially translated from English into Italian so English-speakers are also welcome! Learn how therapy clients’ own personal snapshots, family photographs and pictures taken by others — and the feelings, memories, and thoughts these evoke — can be used to deepen and enhance therapeutic communication in ways not possible using words (or inner self-reflection) alone. Learn how (and why!) to incorporate photo-based interventions into your own therapy or counselling practice — and realize the power of these techniques directly, by participating in several guided experiential practice sessions with Weiser’s (and your own) snapshots. This Introductory Workshop is an opportunity to learn how therapy clients’ own personal snapshots, family photographs, and pictures taken by others — and the feelings, memories, and thoughts these evoke — can be used to deepen and enhance therapeutic communication in ways not possible using words (or inner self-reflection) alone. Learn how (and why!) to effectively and successfully incorporate photo-based interventions into your own therapy or counseling practice — and then directly experience the power of these techniques, by participating* in several guided practice sessions with some of the most important of these (for which participants will receive an “Advance “Homework Assignment” regarding which photos to bring). and prior experience with cameras or photographic art is not required. For more information, see their website here — and to Register, contact Artur Michalski for additional details. This 1-day Introductory Workshop is an opportunity to learn how people’s personal snapshots, family photographs and pictures taken by others — and the feelings, memories, and thoughts these evoke — can be used to deepen and enhance personal insight and lead to positive changes during Coaching sessions, in ways not possible using words (or inner self-reflection) alone. Learn how (and why!) to incorporate photo-based interventions into your own Coaching practice — and then realize the power of these techniques directly, by participating* in several guided experiential practice sessions with Weiser’s (and your own) snapshots. *Sunday evening “introductory” dinner, June 11 (7 pm to 9:30 pm) –plus– Monday to Friday, June 12-17 (9 am to 6 pm each of these 6 days). 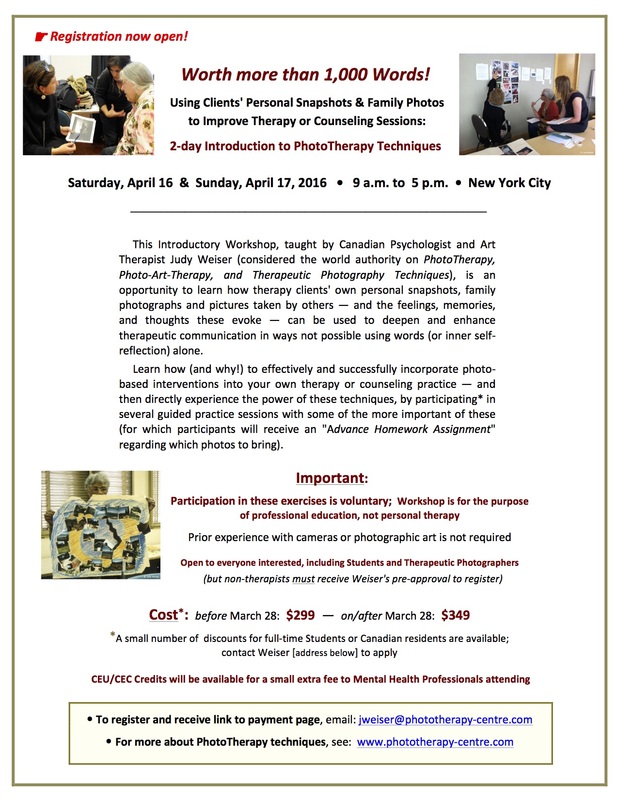 Be trained — under Judy Weiser’s direct supervision — how to use clients’ personal snapshots and family photographs and their interactions with these (and the feelings, memories, thoughts, and expectations these evoke) to deepen and improve the success of therapy sessions. A few others (for example, advanced-level Graduate students or beginner therapists with less than 3 years experience) might be permitted to attend as Observers (but not as Trainees) — application required for possible approval as an Observer. a) Invited Keynote Presentation* (9:15 – 10.30): “Using PhotoTherapy Techniques in Creative Arts Therapies Practices: Working with the “Heart Part” of Photographic Imagery”: *Learn how Creative Arts Therapists and other Mental Health Professionals can use clients’ own personal snapshots and family photographs (and the feelings, memories, and thoughts these evoke) to deepen and enhance therapeutic communication. b) 1-hour Panel* (Weiser, Chairperson) (10:50 – 11:50): “Using Photography to Help Ourselves (and Other People) Find Healing” (Panelists: Ocean Morisset, Nancy Gershman, and Ellen Fisher-Turk): *Panelists will each describe and show illustrations of their unique applications of photos used in personal healing, as way to cope with and survive cancer, to help with the grief and loss process, addictive behaviors, eating disorders, body-image distortion, and low self-esteem. c) Afternoon Experiential Workshop*: “A Picture is Worth More Than a Thousand Words! — Experiential Practice Workshop with the Primary PhotoTherapy Technique”: *This experiential workshop will give participants a chance to practice for themselves the primary PhotoTherapy Technique (“Photo-Projectives“) and learn from their own interaction with photos brought by the Instructor how ordinary snapshots can create meaning, evoke feelings, trigger memories, project inner values, judgments and expectations, and share information — while telling their own stories their own way to each viewer encountering them — and how this can be used to improve therapy practices. This workshop is for the purpose of education and not personal therapy. Learn how (and why!) 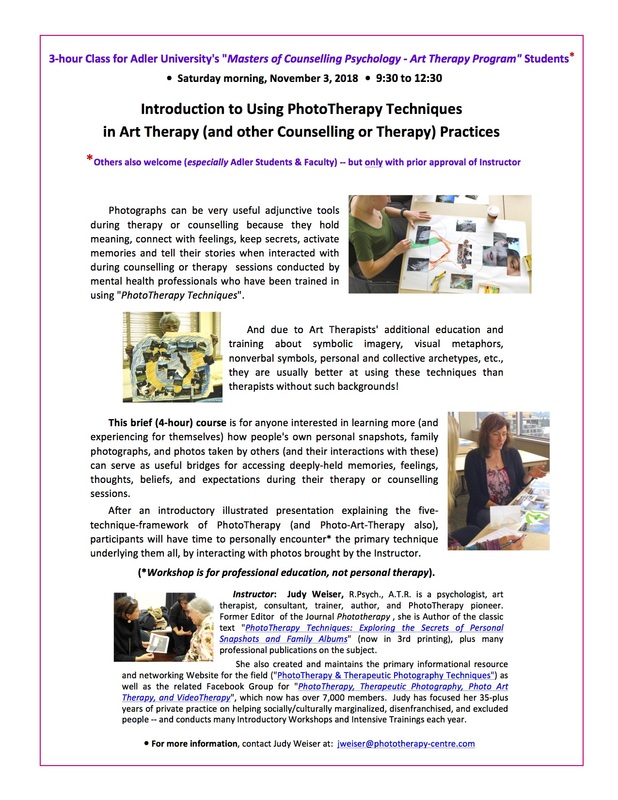 to effectively and successfully incorporate photo-based interventions into your own therapy or counseling practice — and then directly experience the power of these techniques, by participating* in several guided practice sessions with some of the more important of these (for which participants will receive an “Advance “Homework Assignment” regarding which photos to bring). Prior experience with cameras or photographic art is not required. 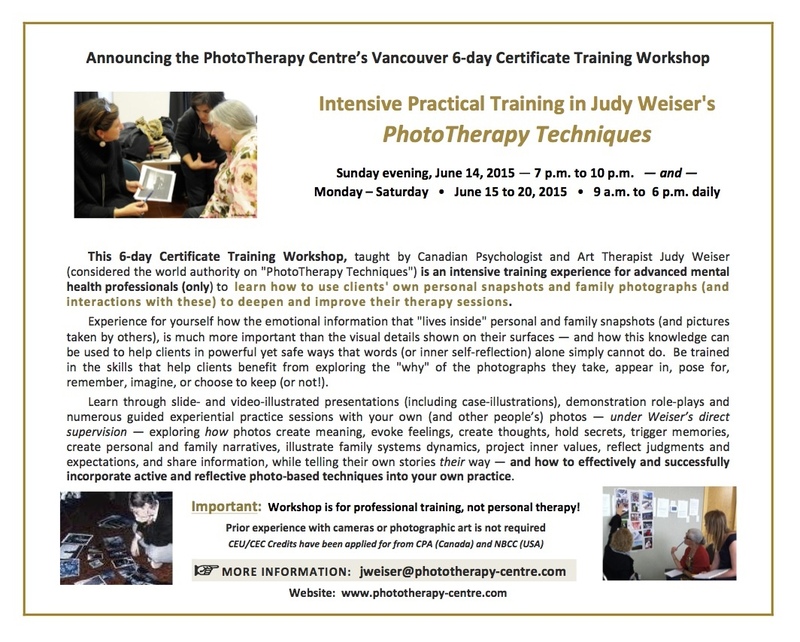 6-day Advanced Training Workshop: Intensive Practical Training in Judy Weiser’s PhotoTherapy Techniques — Sunday evening, June 12 (7 pm to 10 pm) –plus– Monday to Friday, June 13-18 (9 am to 6 pm each day). 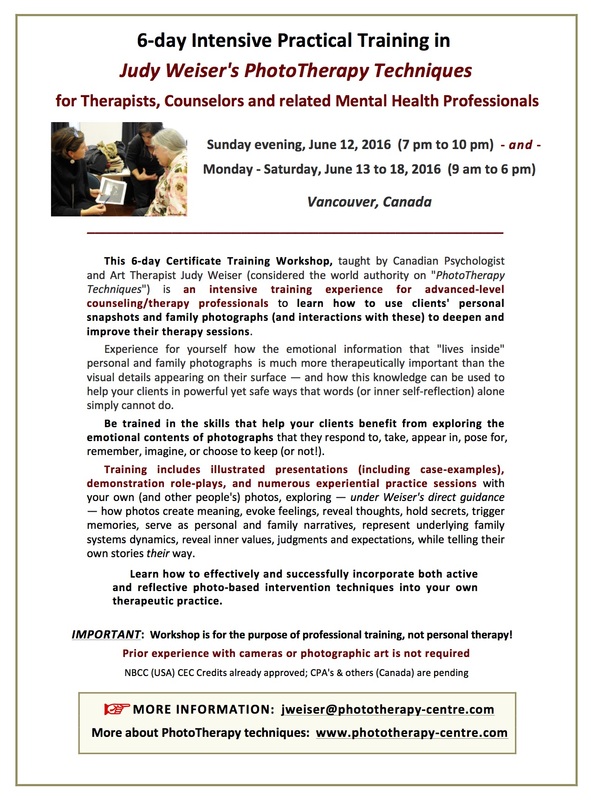 Be trained — under Judy Weiser’s direct supervision — how to use clients’ personal snapshots and family photographs (and the feelings, memories, thoughts, and information these evoke) to deepen and enhance your therapy or counseling sessions helping them. Closed event*; for Students of the Masters of Counselling: Art Therapy Program of Adler University (Vancouver Campus) — however others might be permitted as Observers; contact Judy Weiser directly for more information about this. Coordinated by the Istituto di Terapia Familiare di Firenze [Family Therapy Institute of Florence]: Saturday, March 21 (full day) for Istituto Students only — and Sunday March 22 (half day) for Istituto Faculty only. For the Annual Conference of the B.C. 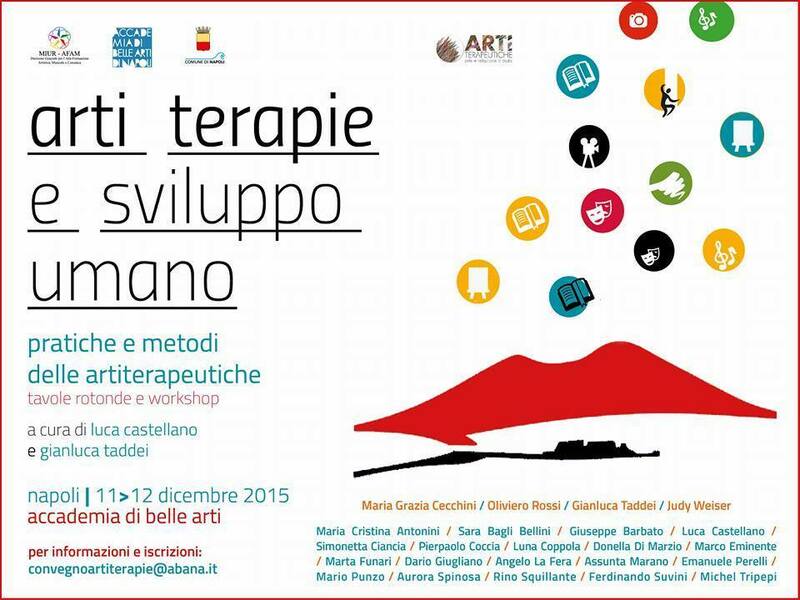 Art Therapy Association. 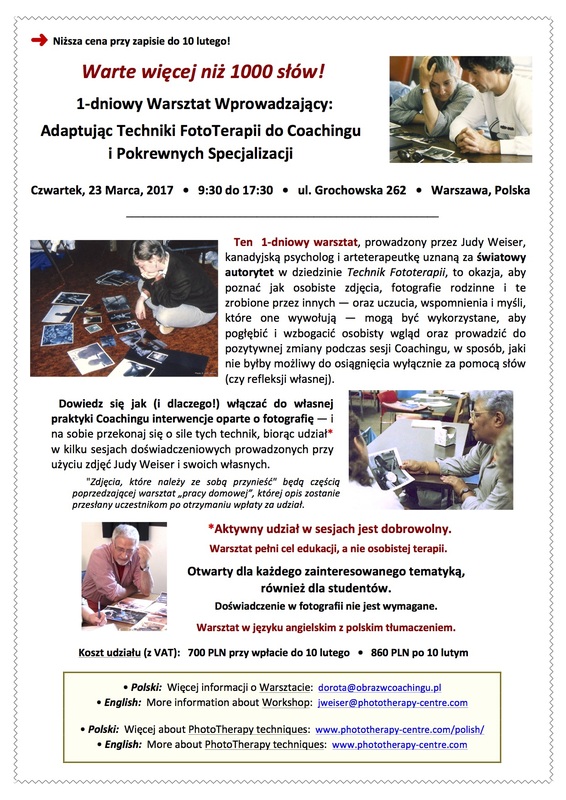 Learn and practice — under Judy Weiser’s direct supervision — how to use photos in your therapy or counselling work helping others. Requirements: Participants must be advanced-level mental health professionals who have completed postgraduate education, supervised training and already had at least 2 years’ direct experience conducting therapy with their own clients. A few others (for example, advanced-level Graduate students) might be permitted to attend as observers (but not as trainees). Closed event; for Students of the Masters of Counselling: Art Therapy Program of Adler University (Vancouver Campus) only. Workshop is for mental health professionals (who can receive CEC’s for attending); students in these fields and non-therapists are also welcome but first must be pre-approved by the Instructor, Judy Weiser. a) Conference Lecture Presentation (Friday, Dec. 11): Introduction to Using PhotoTherapy Techniques in Art Therapy (and other Mental Health) Practices: How exploring personal snapshots and family photographs can improve mental health, produce positive change, deepen multicultural understanding, and improve well-being in people, communities, and society. 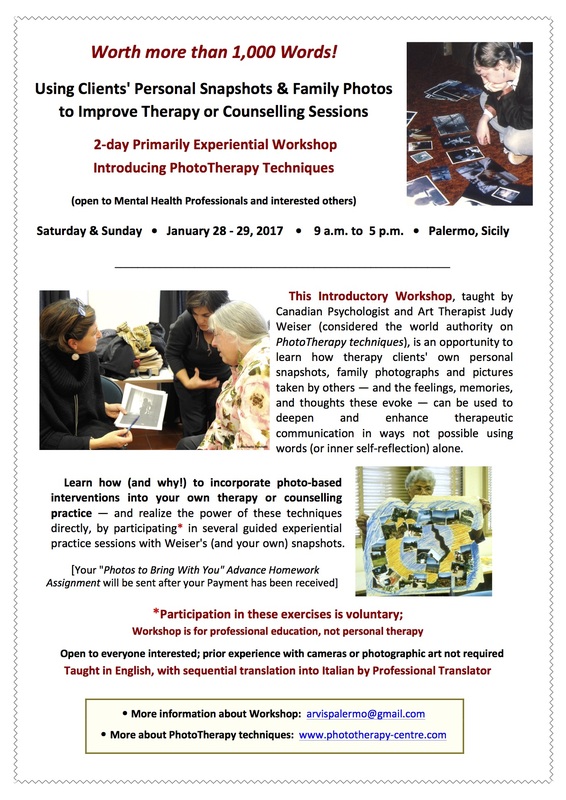 b) 2.5-hour Conference Experiential Workshop (Saturday, Dec. 12): Experience the “Photo-Projective” PhotoTherapy Technique: Learn how photos create meaning, contain stories, and evoke feelings, thoughts, and memories — and how this can benefit therapy, personal healing, and social change. 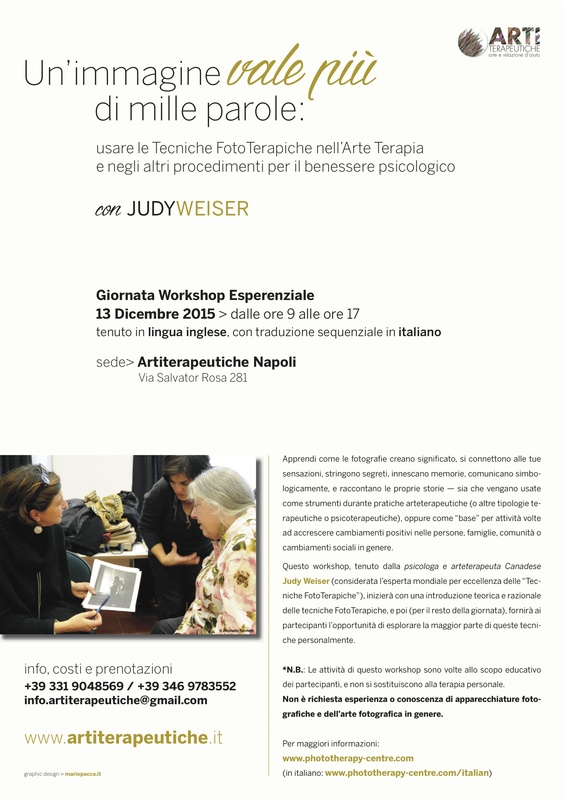 Full-day Introductory Workshop by Judy Weiser, in partnership with the School “Arti Terapeutiche” in Naples, Italy: A Picture is Worth a Thousand Words: Using PhotoTherapy Techniques in Art Therapy and other Mental Health Practices (Introduction and Personal Encounter Experience). a) 3-hour Lecture Presentation (Saturday morning, Dec. 19: 10.00 – 13.00): L’utilizzo delle tecniche di FotoTerapia in psicoterapia corporea: Prima parte — teoria e dimostrazione. (“Using PhotoTherapy Techniques in Body Psychotherapy: Part One — Theory and Demonstration”). 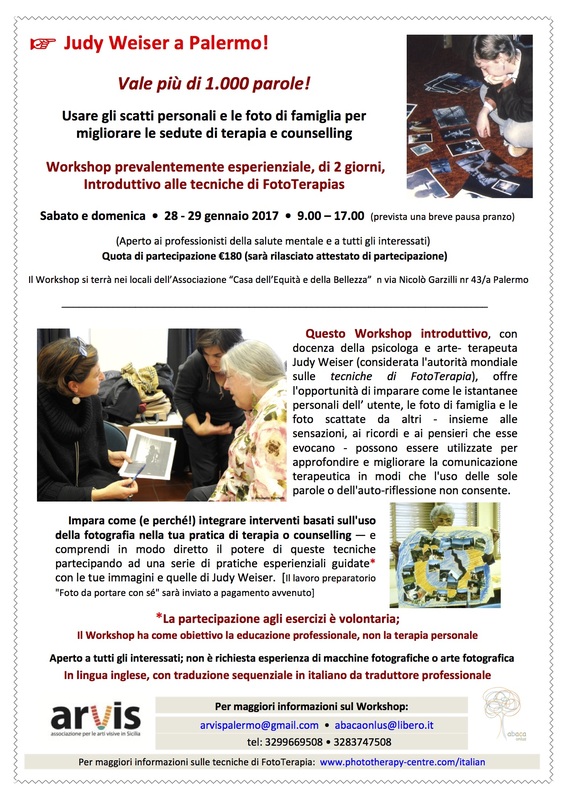 b) 3-hour Experiential Workshop (Saturday afternoon, Dec. 19: 14.00 – 17.00): L’utilizzo delle tecniche di FotoTerapia in psicoterapia corporea. 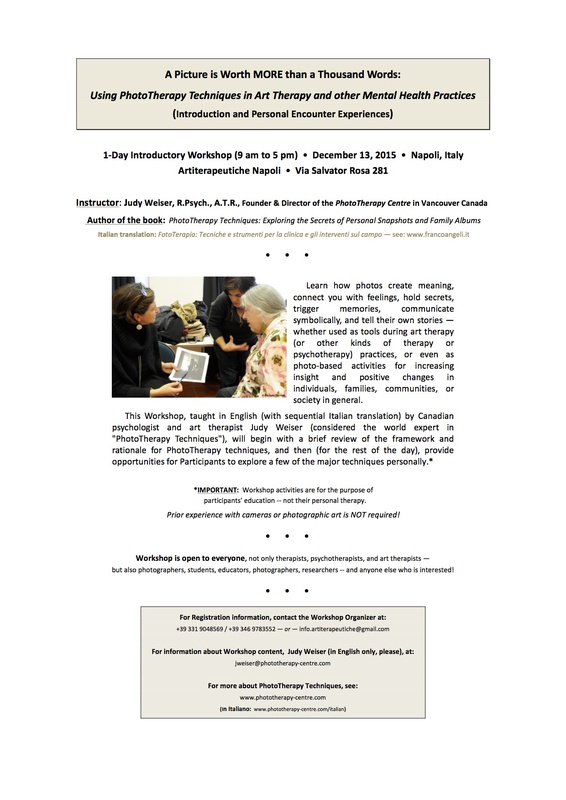 Seconda parte: esperienza pratica (“Using PhotoTherapy Techniques in Body Psychotherapy: Part Two — Experiential Practice”). This Presentation by Judy Weiser opens the 1-day Conference, “Experiencing Photography #3: Using photos to improve well-being, reduce social exclusion, and provide healing” that is part of the Third Annual Perugia Social Photo Festival. This 2-hour Demonstration Workshop during the Third Annual Perugia Social Photo Festival will provide participants the opportunity to explore for themselves how photos create stories and evoke thoughts, feelings, and memories — through interacting with photos brought by the Instructor, Judy Weiser. 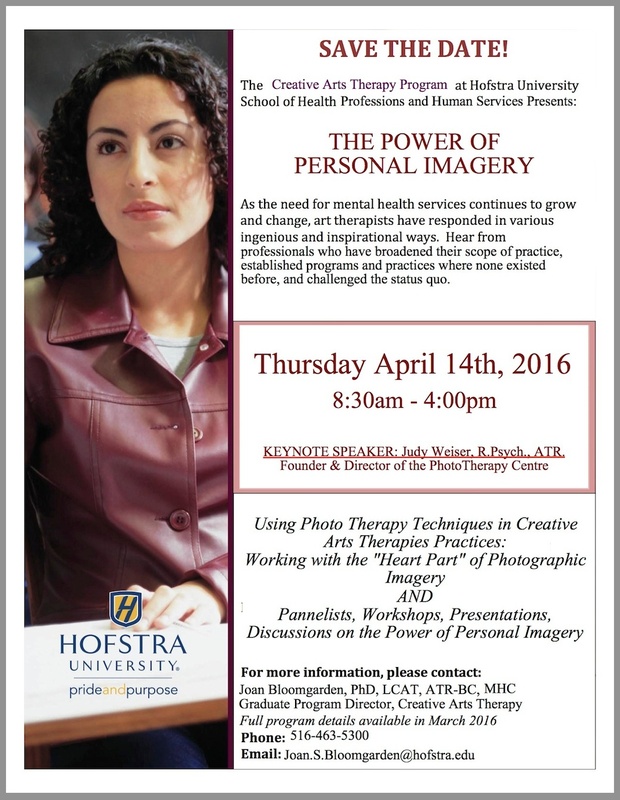 Weiser’s is one of three experiential Workshops that day on the use of photography as a tool for self knowledge. Each Workshop lasts two hours and is open to everyone interested. They are not for the purpose of personal therapy or training. 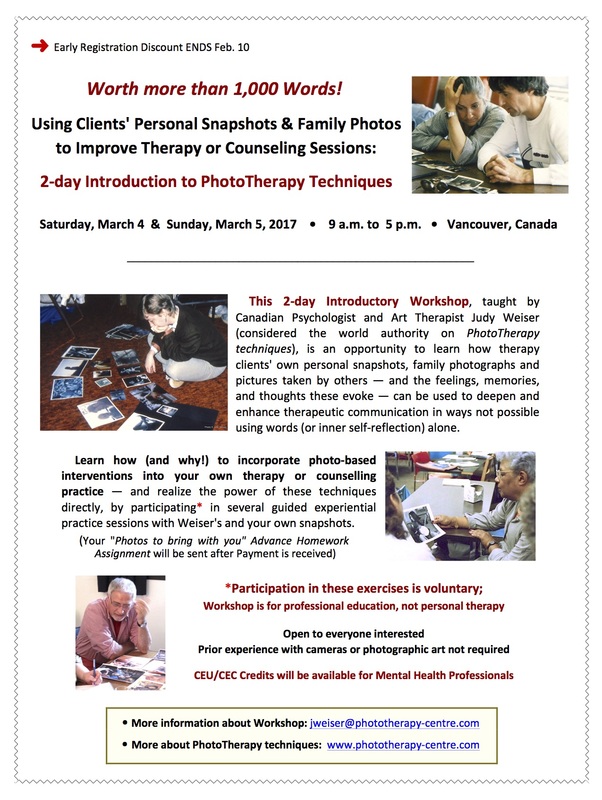 Learn and practice — under Judy Weiser’s direct supervision — how to use photos in your therapy or counselling work helping others. This Workshop will be taught entirely in English, with no translation into Italian. Requirements: Participants must be advanced-level mental health professionals who have completed postgraduate education, supervised training and already had at least 2 years’ direct experience conducting therapy with their own clients. A few others (for example, advanced-level Graduate students) might be permitted to attend as observers (but not as trainees).